1.First paint the cup white and the ball pink. Leave it for dry. Stick the ball to the bottom of the cup. 2.Take tartan paper and cut an arch shape from it. Fold little pleats along the length, Leaving a flat piece at on end. Stick a length of double sided tape around the middle of the cup and roll the tartan paper around this to from a kilt. 3.you have to take blue felt and cut out small pieces to be the waistcoat. Glue in place. Cut a rectangle from the blue felt that reaches from the top of the kilt to the top of the cup, then cut a small “ V” shape off each corner. Glue to the cup as your jacket. Cut two arms from blue felt and two hands from pink. Glue one hand to the end of each arm and the other of the arms to the jacket. 4.Take the ribbon and tie a small bow and glue on as a bow tie. Glue wool on to the top of the ball as hair. 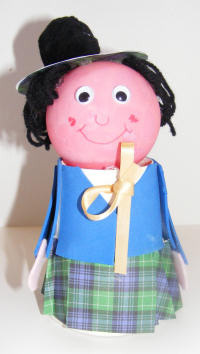 5.Again you have to take tartan paper and cut two circles from it. Glue back to back then stick to the top of the head. Finish with a pompom. Finally Glue on two wiggle eyes and draw on a nose and mouth.